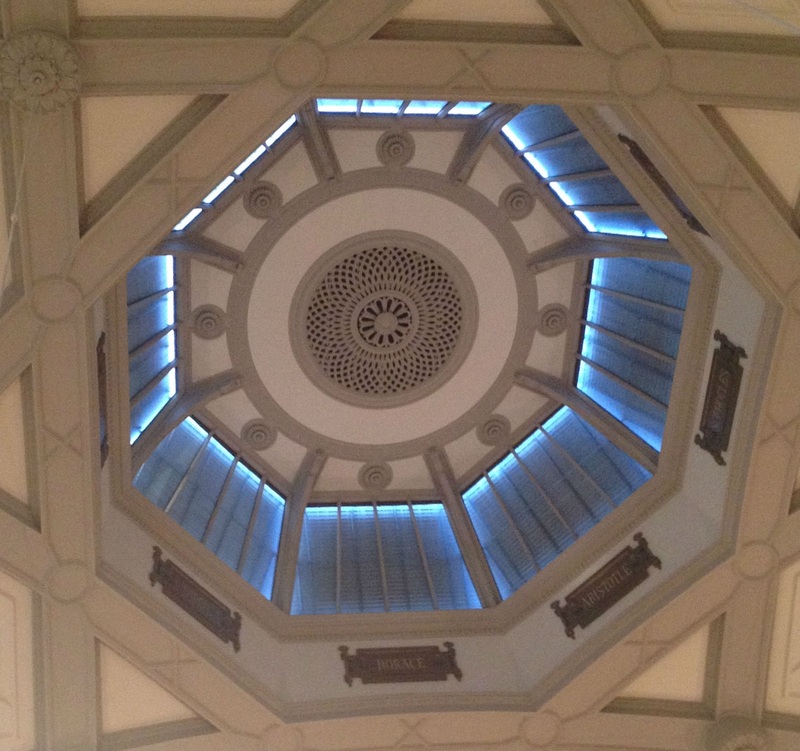 I've just returned from my third Romantic Novelists' Association Conference at Queen Mary University of London. Writers' conferences certainly help with topping up the writing inspiration, because being surrounded by successful authors, and industry professionals makes you feel part of that world. Seeing friends who write is also wonderful, and we always have so much to talk about during our kitchen parties over Prosecco and crisps. This was the first conference I've attended as a writer and a Freelance Social Media Manager, and I was grateful to see so many talks on book marketing in the programme. 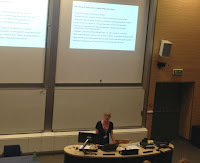 I tweeted during the conference from both of my Twitter accounts using #RNAConf15 (do take a look at this hashtag to find out more about the conference, and to see photos), using @neetswriter for personal and writing tweets, and @neetsmarketing for tweets on the marketing talks. 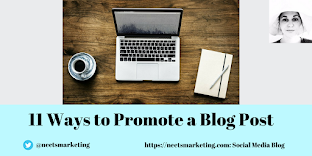 This post will be about my experience as a writer and my neetsmarketing post will cover three fantastic marketing talks by: Hazel Gaynor, Kate Harrison and Alison Baverstock. Julie Cohen’s reputation as an amazing creative writing teacher precedes her, and thankfully I managed to get up on Sunday, grab a fry-up to soak up the two-day hangover; and make it to her talk on time. 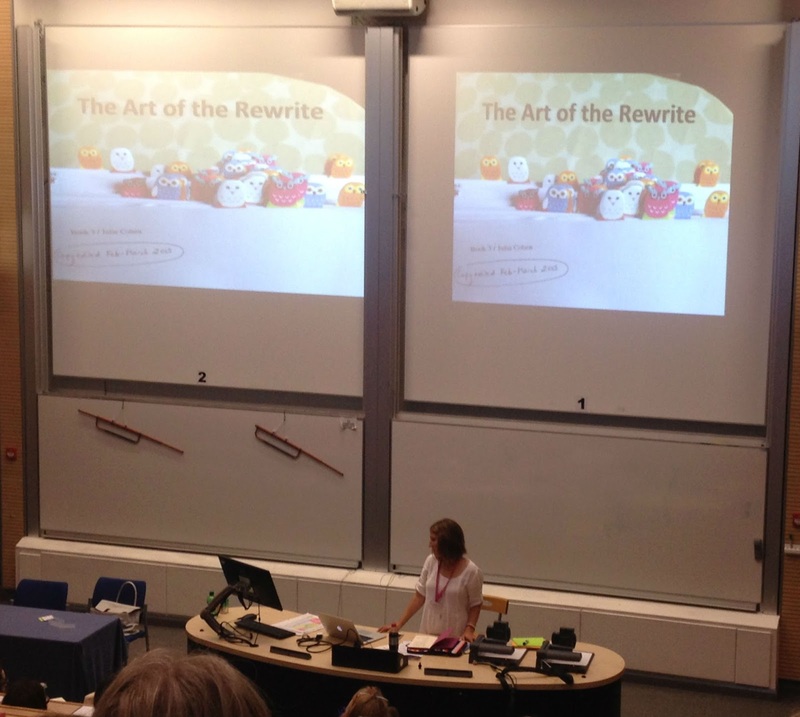 Julie was witty and inspiring, and she engaged a lecture theatre packed with flagging delegates for the whole hour, by cracking jokes, and with clear, concise explanations of how to go about rewriting a novel. Write your first draft as quickly as possible. Then celebrate (preferably with Champagne)! She said, it’s important to celebrate every writing achievement, because as a writer you will fail a lot, so you need to celebrate every single success. Make a list of revision points, and leave the manuscript for a few days at least, if possible. Revisit the revision points and make more. Julie never shows anyone her first draft, but says if you do, show it to the right person (someone who is honest, and 100% positive), cry and rant if necessary (but not on the internet), then make more revision points. Make Macro and Micro revisions. Macro revisions are about story structure, characters, plotting, pacing, beginning and ending, consistency and continuity. Julie said it’s worth working on the beginning and ending separately because the beginning ‘hooks your readers in’ and the ending is ‘what sells your next book’. Micro revisions are more about show and tell, realistic dialogue, accurate and evocative description, strong verbs, grammar, punctuation, spelling, repetition, research points and R.U.E. (‘Resist the Urge to Explain’). Julie doesn’t do research too early, and highlighted the need to avoid ‘info dump’. When it comes to planning and editing, Julie prints out her manuscript and works with paper, Post-it notes, scissors, and coloured pens. She cuts pieces out of her manuscript with scissors and throws them away, then sticks it all back together. She uses real calendars for her timeline with Post-it notes, so she can move them around; and she uses Post-it notes for planning on the back of a whiteboard (she writes on the front) or on paper because they can be moved, they’re colour-coded and they can be thrown away easily. I enjoyed Julie's talk, and would love to attend one of her courses. I attended one of Emma’s creative writing courses a few years ago, and it was great to hear her speak again. Her ‘This Itch of Writing’ blog is excellent, and you’ll find everything mentioned in her talk under the tool kit section; including a detailed explanation of 'Psychic Distance'. Emma's blog is well worth a peruse when you have a moment for advice on creative writing. I can’t wait to read her ‘how to’ book on historical fiction, which comes out in the autumn. My novel is set during the eighteenth century, and I am a big fan of Charlotte Betts’ writing. I especially enjoyed The Apothecary's Daughter (which I mention in another post here), and must download ‘The Chateau on the Lake’ for my summer holiday reading. 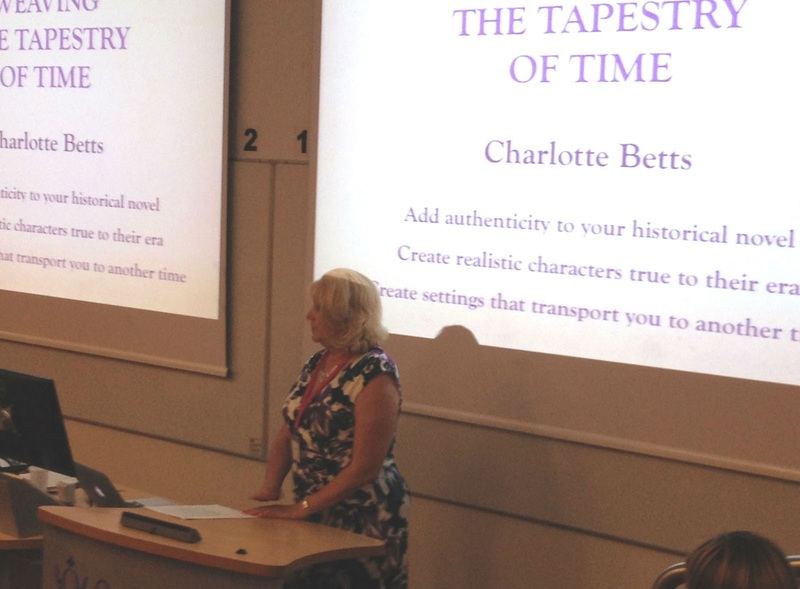 In this workshop, Charlotte ran through ways to do research and talked about how to transport your reader to another time by using the senses. She recommended visiting the location of your novel if you can, and then to sit there and mentally block out anything modern. Ask yourself what you can see and hear, feel the stone on the walls, then log it all in a notebook and return to those notes when you write scenes set in that place. We had to write a character profile for someone from an illustration Charlotte provided of a courtyard in Delft, or from some information on the Battle of Hastings. Then we had five minutes to write a short scene from that character’s point of view at a pivotal moment in their life, a useful exercise. I find writing exercises set to a timer bring out something I didn't know was there, and I must do them more often. During Charlotte's talk, I learnt that you need to be careful with flora and fauna, because many flowers have been brought from overseas and they may not have existed in the period you are writing in. A lady in the class said she kept a list of flora and fauna, with which season they appear in-a great idea! We also talked about religion, and how in a historical novel you cannot avoid referring to religion in some way. And I’m very excited to tell you that I shall be going to Italy this summer, driving there with my family, through France and Switzerland, along the Aosta Valley, to Lake Garda, and we’ll spend a day in Venice, the setting for my work in progress. I'll certainly be doing what Charlotte Betts recommended when I get there. This will be special, because my family used to drive to Italy every year when I was a child. I cannot wait, and shall return with lots of photos. Here’s one for now, and more pics of Italy can be found on my Pinterest boards. 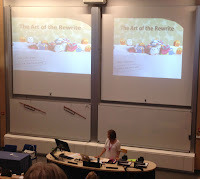 Book Marketing from #RNAConf15, Part I covers the fabulous talk on 'Promotion Commotion' by Hazel Gaynor. Book Marketing from #RNAConf15, Part II covers the talks by Alison Baverstock and Kate Harrison. Do use of three of the talks which I missed . Thank you for filling in the gaps, Anita. 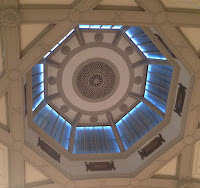 I'll share this blog with Adrienne Vaughan as she's always looking for people to write up articles for the magazine, RM. on a more personal note it was lovely to see you there !! Thanks for sharing on Facebook too Lizzie, and for commenting. Always so great to see you! Thank you, Liz! Lovely to see you too. Thanks for posting about those three sessions, Anita, as I wasn't at two of them and only managed to hear a small part of Julie's because of an appointment. Great to see you again! Ps: was lovely to meet you 'in real life', even though it was brief. Hope to see you at another RNA event soon :-)x.
Wow! I'm so jealous - sounds like you all had a great time. Good to hear things are going well for you too. Enjoy Italy! Thanks so much Maria! Wish you were a member of the RNA, would be lovely to meet you 'in real life'. (I owe you a few blog comments, will visit as soon as I can get there :-)). Thanks, Neets - an excellent summary. My head is still spinning! Thanks for reading, John, and for your comment! Enjoyed perusing your fantastic pics earlier, a lovely memory of the weekend :-). Thanks for sharing, Anita. 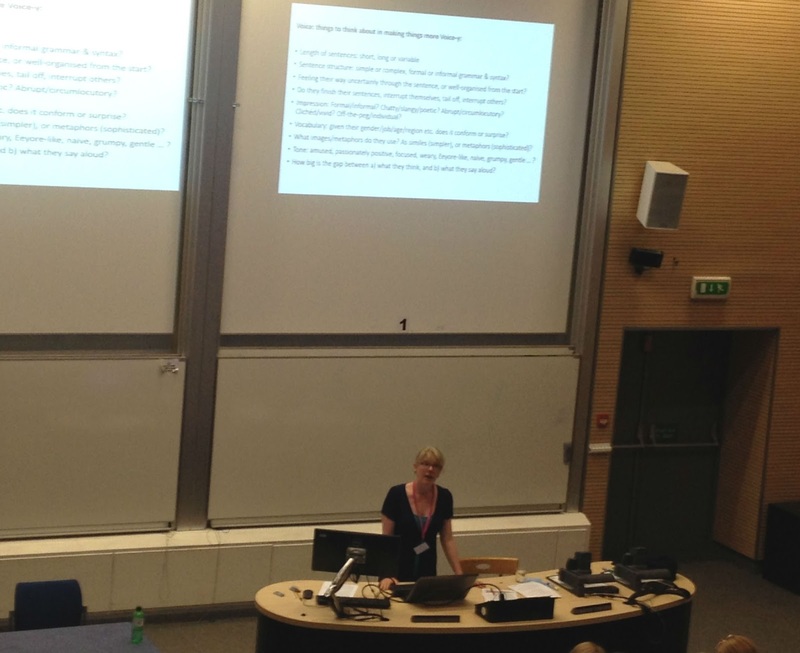 Julie's talk was fabulous, I always learn such a lot from her talks at RNA conferences. Thanks very much for reading, Kate! Yes, must go on one of Julie's courses.